Only a month old, Connect Coffee Roasters, located on the ground floor of The RiverFront off of Riverside Drive in Nairobi, Kenya, the new spot is quickly becoming a favourite destination for study sessions, friendly catch-ups, and a quality coffee experience where you can customize the way your cup will be brewed. The Chemex® coffeemaker is an elegant, one-piece, hourglass shaped vessel made of high quality, heat resistant glass. The traditional model comes to you with a polished wood collar and leather tie, which is the one served at Connect Coffee. Few products in this century can match the flawless blending of design and function of the Chemex®. Its visual elegance has earned it a place in the permanent collection of New York’s Corning Museum of Glass. Cups of coffee are made almost to perfection: clear, pure, flavorful and without bitterness or sediment every time. The coffee only comes in contact with the scientifically designed filter and non-porous glass. With the Chemex® method, you can make coffee as strong as you like without bitterness. Established in 1958 in Tokyo, Japan, KALITA JAPAN has expanded from their beginnings as a manufacturer of paper coffee filters, to a full-line manufacturer and distributor of professional and domestic coffee preparation tools. 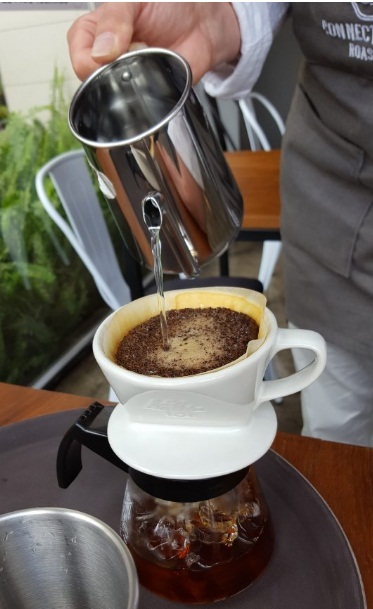 Using a Kalita ceramic dripper, at Connect Coffee, the experience provides an even extraction that makes brewing a perfect cup consistent and easy. What is an Espro Press?